A late spring storm struck hard in Boone County and other areas of North Central Nebraska last Friday, April 11. 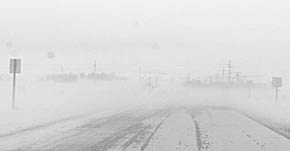 The storm packed strong winds that created near white out conditions, especially on east-west roads, and most schools in the area were closed. Some spot power outages were also reported due to the wind. Sunny skies had returned to the area by late Friday evening.